I work with both men and women in a wide variety of professional fields, age groups, and lifestyles. My styling and wardrobe consultation offerings are outlined below. All services are available either in-person or virtually, depending on your preference. I tailor my work to fit my client’s interests, schedules, and time constraints. Ever wonder whether that favorite shirt is still in style enough to keep, or if a particular cut of jeans are coming back? Find yourself staring at a wall of clothes and feeling like you have nothing to wear? During a closet assessment and analysis, I work with you – either in-person or virtually – to review, organize, and revitalize your wardrobe. I help you part with outdated items and put together new looks from your existing clothing. I also identify a few additional pieces to liven up your typical routine, and show you new ways to accessorize your outfits so that they feel new and refreshed. You’ll finish this process with a photo Lookbook that curates all of your new looks for future reference. Many people have never taken the time to truly understand which styles and colors look best on them. Through a personal consultation, I teach you how to identify which styles work best with your body type and silhouette. We will also discuss which colors are best suited to your natural palette. You’ll learn how to use color, accessories, and makeup (if applicable) to match and enhance your personal duende. I follow-up with an innovative Look Book, showcasing styles that will fit both your figure and your personality. Some people love to shop, others dread it. And sometimes you just don’t have time to find that perfect piece. 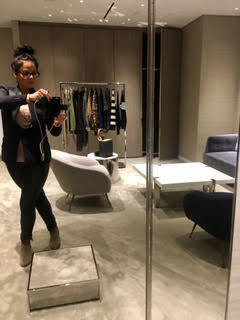 I tailor my personal shopping services to fit my clients’ schedules and interests. Some clients and I will shop together, others prefer that I curate and bring items to their office or home to save time. My goal is to make shopping fun, stress-free, and efficient. I can also help you shop and find gifts for family members and loved ones. With more than a decade of experience in merchandising for brands like The Gap and Banana Republic, I bring an insider’s view to industry mark-ups. I look for pieces with longevity that are within your budget and worth their price. I can also teach you about how retailers put together and place merchandise to influence your decisions, so that you can develop your own, cost-effective shopping techniques too. San Francisco offers a broad array of fabulous vintage shopping opportunities. For those on a budget or looking for a creative, classic piece, these stores are treasure troves of sartorial options. I will introduce you to my favorite go-to spots, pick up items for you, and, if needed, take your older items to consignment shops so that you save time and get the best value. Have a milestone birthday coming up? Giving a plenary talk at a professional meeting? Whether it’s a personal celebration or a work event, I can help you put together your look, from head to toe. We’ll start by discussing the venue, your typical style, and how you want to feel during this moment. Then I’ll do the shopping for you. You can either meet me to try on the pieces I find, we can brainstorm ideas virtually, and/or I can bring options directly to you to try on. I specialize in finding the right pieces for you and your budget, so that you can feel your best without excessive expense. Taking on a new job that requires you to dress differently? Want to try something new with your look or regain confidence my updating your wardrobe? I work with you to understand your goals, whether it’s finding a revamped sense of style as a mom, learning to dress for a new career in management, or feeling good on a first date. Together, we define your new style and combine key elements of your current wardrobe with fresh pieces for your updated look. I bring my experience working with both runway shows and print media to both corporate and individual clients who need to create looks, find outfits, and get ready for the camera. Whether it’s a formal fashion shoot, an engagement photo session, or simply a family portrait, I can help you find the right clothing. For those not in the modeling business, I also show you how to pose for your body-type so that you get the look you want in your photos. First impressions matter, and it’s important that you and your employees portray the right image for your business. I offer all of the above services for corporate clients who want to help employees dress for new, public-facing roles, or find the right look for important presentations and photo opportunities. Virtual styling can be done from the convenience of your own home no matter where you live! I offer three options to conduct my virtual styling services via video chat – by FaceTime or by Skype or email with photo boards. We can chat one-on-one which is personal and allows me to visit your closet virtually. I am able to style you according to your taste and fashion needs. You can be at your closet or on your phone out shopping. I also can help style you via text, through photos. Just snap a photo of your item or yourself and I can help you decide. My services can be tailored to fit your needs and technology comfort. *Gift Certificates for services have no expiration and are non-refundable. *We kindly request a 24 hour cancellation notice on appointments or full service charges will apply.